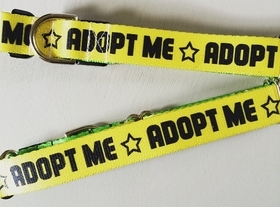 Yellow 'Adopt Me' collar, 1" wide, outstanding accessory for pups looking for their forever families. Available in buckle and martingale styles. Handmade with love.